Jake Sherwood opened the scoring for Little Common in their 4-0 win at home to Steyning Town. Little Common's footballers moved up to second in the table after scoring four goals for the second successive game. 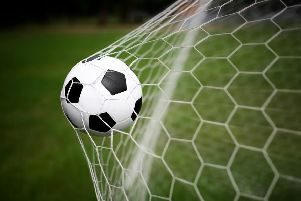 The Commoners won 4-0 at home to a Steyning Town side which played the majority of Tuesday night's Macron Store Southern Combination Football League Division One match with 10 men following a first half red card. Martin Denny put Little Common two-up against Steyning. Common player-manager Russell Eldridge said: "I'm really pleased with the result and as a whole the performance was good as well. To score four goals in two successive games was good and to keep a clean sheet was good as well. It was a job well done." Common were a bit edgy to begin with and their passing wasn't as good as it should be, but still probably had the upper hand. Their cause was helped by Steyning player Ben Greer receiving a straight red card for dissent midway through the first half. That settled Common down and their passing began to improve. Eldridge hit the post from the free kick which followed the red card, Lewis Hole had a long range effort tipped over, Martin Denny twice went close and Jake Sherwood dragged a shot wide at the end of a run from halfway. Sherwood gave Common a deserved half time lead with a goal in the 44th minute, beating a couple of players and this time slotting home. Common didn't start the second period very well and allowed Steyning too many opportunities to get strikes at goal, but the longer the game went on, they managed to wear the visitors down with some good possession football. Denny made it 2-0 after the ball was cut back into his path and Harry Saville calmly converted a penalty for number three having won the spot-kick himself. Dom Bristow placed the ball into the bottom corner for a late fourth goal and there was still time for Jamie Crone to hit the crossbar in the last minute. Common: Cruttwell; Sherwood, Ammoun, Aston, Curteis; Denny (Bristow), Eldridge, Saville, Foster (Wells); Crone, Hole (Sloat). Standings (played-points): 1 Mile Oak 6-15, 2 LITTLE COMMON 6-13, 3 Saltdean United 6-13, 4 Langney Wanderers 5-12, 5 Lingfield 5-12, 6 East Preston 4-10, 7 BEXHILL UNITED 6-10, 8 Storrington 6-9, 9 Steyning Town 6-9, 10 Selsey 5-5, 11 Midhurst & Easebourne 5-5, 12 Oakwood 6-5, 13 Billingshurst 6-5, 14 Ringmer 5-4, 15 Southwick 6-4, 16 AFC Varndeanians 5-4, 17 Seaford Town 5-1, 18 St Francis Rangers 5-1.